It’s been a long time since there were any published numbers for kite spars. The charts that I could find, were either outdated, or confusing. I couldn’t find out how these numbers were even arrived at. With so many new spars on the market, the time had come for some more recent numbers. After some searching, I found what is considered to be the “Standard” for testing of archery shafts. I then built an apparatus, that would allow me to do the testing. Hopefully, these numbers can prove helpful to everyone, from flyers to manufacturers and dealers. These tests were done independently. While some manufacturers were aware of the testing, none were involved in the actual testing. In an effort to keep it fair, all rods were either paid for in full, or were lent to me for testing, and then returned. This made it easier to post unbiased results, and stick to numbers only. The accepted archery standard for measuring deflection is to measure the amount of deflection of the shaft at the midpoint of a 26″ span when placed under a 2 pound load. The more deflection, the less stiff the shaft. The function of this test equipment was to support the shaft on two points that were 26″ apart, place a 2 pound load at the midpoint and measure the deflection as accurately as possible. To measure the deflection, I used a machinists dial indicator. It does have a return spring, which due to the sensitivity of the test, did affect the readings, by lessening the weight slightly. 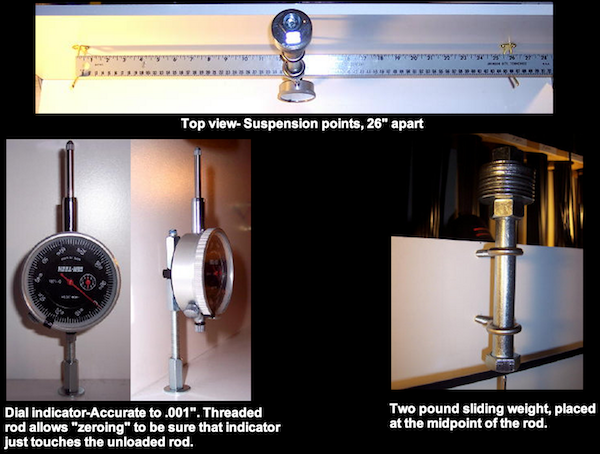 For the purpose of these tests, I placed the weight on the suspended shaft, pulled the rod on the dial indicator down until any tension was removed. This allowed the shaft to settle completely. The indicator was then released until just making contact with the shaft without applying any pressure in the opposite direction. Readings were taken from this point and logged. Test were done on a minimum of 12 shafts to be considered complete. If I didn’t have access to enough shafts, the numbers were shown but, were considered incomplete and will be shown as such. Disclaimer-Any thoughts expressed in these pages are purely my own, unless otherwise stated. 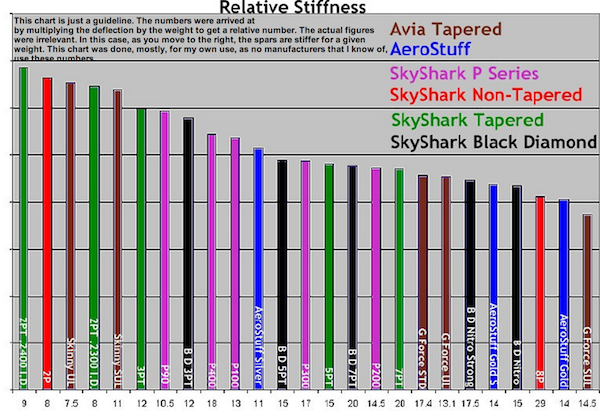 I didn’t include numbers in the “Relative Stiffness”, as this chart is, well, made up. The numbers were arrived at by multiplying the weight by the deflection, to get a stiffness to weight ratio. 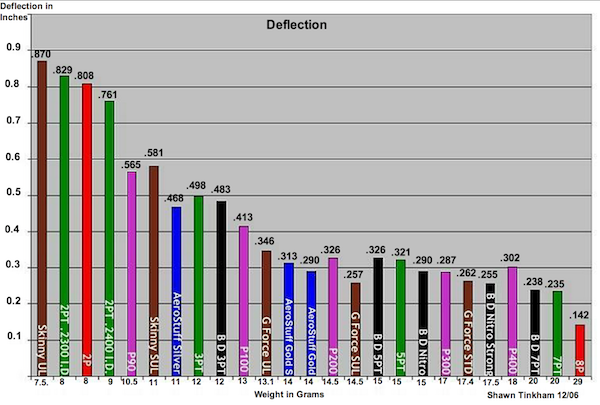 In this case the lower the number, the less deflection for a given weight. The numbers are not used by any manufacturers, that I know of. They were done as a guide for me. I decided to include them in the site, in the hopes that they may help. There is no magic formula for choosing the right rod for an application. While it makes sense to want the lightest, stiffest rod you can get, that may not be the case. A spar that is too stiff can be brittle and break too easily. If it is too soft, performance can be lost, through frame distortion. It seems that the secret is to use a spar, or comination of spars, that is stiff enough to achieve the desired performance, while retaining enough flexibility to be durable. Assuming that the same methods and materials are used, the only way to make a spar stiffer, while keeping the weight the same, is to increase the diameter. This means a thinner wall and less resiliency upon impact. Conversely, a smaller diameter spar, while being durable, may prove too flexible for the application. Tapered spars can be used to concentrate stiiffer parts of the spar in certain areas. This can be varied even further by where the spars are cut. A full length, tapered lower leading edge, would be more flexible than one the had been cut. Tapered spars can also be used to alter the static balance of the kite, due to the thinner ends. one best suits our needs.